Exfoliating the top layers of dehydrated cells with a good skin scrub promotes a youthful glowing skin. Cleansing your skin with a quality salt bar rubs away dead skin cells that cause your skin to look dull. The fine salt grains cleanse pores unlike any soap or cleanser can, allowing your skin to breathe easier. 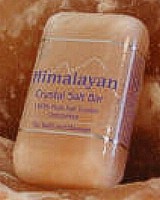 The solid crystal Himalayan Salt Crystal Bar is great for baths and showers. Each unscented bar is 9 oz. Buy three or more, save 10%.